The content of ANBAD is, of course, almost wholly dictated by world events. While Libya has crumbled, hope and joy have sprung eternal – and who better to expound such life-affirming virtues than a 56 year old human man who thinks he’s Peter Pan? 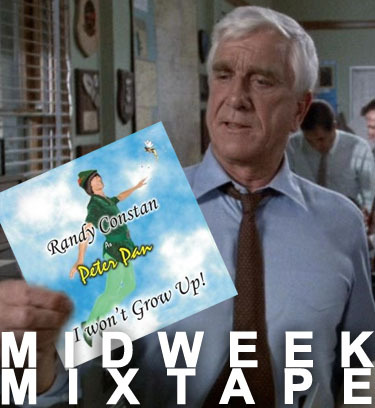 Lt. Drebin is examining the evidence to determine if Randy will, in fact, ever grow up. FIRST! SEAMS uses samples of a woman playing the hang outside a market hall he shops at. I hope the woman doesn’t have a good lawyer, else there’s a royalties nightmare just waiting to happen. Still – the resulting song, Hung Markets, is a hypnotic and dainty, self-cannibalising treat. SECOND! Well, with a name like that, of course Hypocrite in a Hippy Crypt was always going to appear on ANBAD. Don’t let my foibles disguise the fact that The Town Crazies is the kind of delightful song that, in a saner world, would be heard by lots more people. THIRD! “Cesspool”, eh? That’s a bandname that’ll have the girls flocking. If the name doesn’t give the groupies cause to hesitate, then maybe the bizarre, cracked blues of Heartbreak might. It’s a song that could possibly whelp a further couple of songs from its dense brew of noise – but for now, just feel the width. FOURTH! Binary make the kind of grand, skyscraping music that rarely finds its way onto this website – and whilst maybe such a stance is usually for the best, today somehow demands glossy, bright, gutsy rock. Delivered. Posted on August 24, 2011 by Joe Sparrow. This entry was posted in Headline, Today's New Band. Bookmark the permalink.